Hana Chmielewski, one of the seven finalists from 60 entries, speaks to a judge at the 18th Annual EWC Symposium. 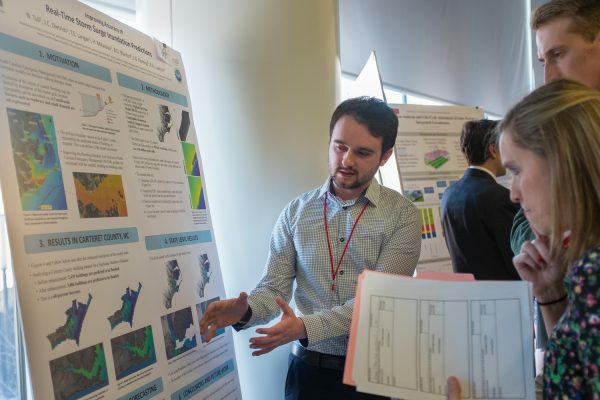 The 18th annual Environmental, Water Resources and Coastal (EWC) Engineering Graduate Research Symposium was held on March 2nd in the Duke Energy Hall at Centennial Campus’ Hunt Library. This year’s symposium was among the largest ever, with 60 posters presented by students, and over 30 judges from government, industry and academia participating. Numerous judges noted how impressed they were with the quality and diversity of research showcased at this year. 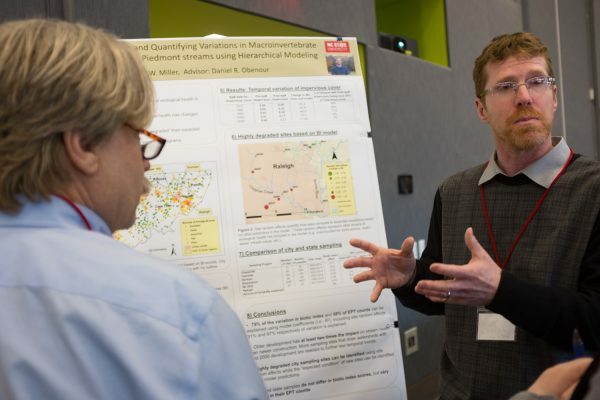 Competition for the poster awards was strong, with Ph.D. students Jacob Monroe and Nelson Tull emerging as co-winners of first prize, and Jonathan Miller receiving the third place award. They were selected from a total of seven finalists which also including Hana Chmielewski, Mathew Jacob, Katelyn Mueller and Jacqueline Yeh. Nelson Tull speaks with judges at the EWC Symposium. Tull’s poster presentation was one of two that tied for first place. The symposium wrapped up with a keynote talk from Professor Scott Hagen from Louisiana State University. In his inspiring talk, Dr. Hagen discussed impacts of climate change on sea level rise, marsh evolution, and land loss. 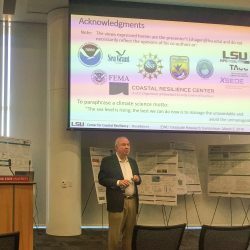 Apart from discussing research results, Dr. Hagen emphasized the need to preserve coastal landforms to mitigate the effects of surge and nuisance flooding. Dr. Scott Hagen delivered the keynote talk. The posters lining the large room, and the lively discussions between students and judges created an impressive showcase of the breadth and depth of research activities going on within the department’s EWC group. For a complete listing of all 60 students who participated as well as information about our sponsors and judges see the program booklet here. Jonathan Miller was the third place winner, from among 60 entries. You can find many more photos from the 18th annual symposium on our Facebook page here.